To promote the iPad Pro, Apple Pencil, and Smart Keyboard, several Apple executives gave interviews to a number of media outlets ahead of the release of the tablet and its accessories. Last week we shared a Jony Ive interview from The Telegraph where he spoke on the Apple Pencil, and today, Wallpaper has published a second Ive interview with even more of the design chief's thoughts on the stylus accessory. Speaking on the conception of the Apple Pencil, Ive said that while it was originally "fundamentally important" to develop a user interface that was based on fingers, Apple discovered there were people who would benefit from an instrument that would enable more precise interactions for drawing and writing. Ive said developing the Apple Pencil and iPad Pro in tandem was essential for a natural drawing experience. It was important that we develop the UI based upon multi-touch, based on our fingers. The reasons are obvious. I think it is equally obvious that you're just not as dexterous as you are with a pen or a pencil for certain things. What we found is that there's clearly a group of people that would value an instrument that would enable then to paint or draw in ways that you just can't with your finger. And I suspect that this isn't a small group of people. I don't think it's confined to those of us who went to art school. Ive went on to talk about the naming of the Apple Pencil, explaining that he preferred "Pencil" to "stylus" because stylus "seems a product that's about technology," while Pencil "seems very analogue in its association." Apple has a specific role in mind for the Apple Pencil, and that is not as a finger replacement. According to Ive, the Pencil is for making marks, while the finger is to be used for other user interface interactions. 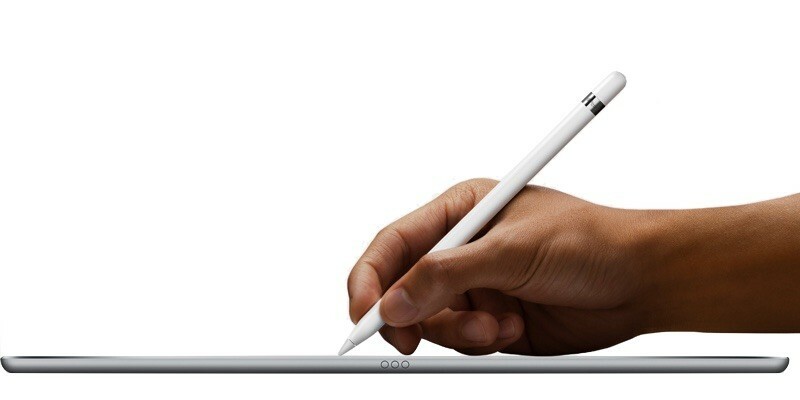 Each tool has its purpose, with the Pencil serving as a "far better" way to make marks on the iPad Pro. I think there's a potential to confuse the role of the Pencil with the role of your finger in iOS, and I actually think it's very clear the Pencil is for making marks, and the finger is a fundamental point of interface for everything within the operating system. And those are two very different activities with two very different goals. So we are very clear in our own minds that this will absolutely not replace the finger as a point of interface. But it is, and I don't think anybody would argue, a far better tool than your finger when your focus becomes exclusively making marks. For more of Ive's opinions on the Apple Pencil, his full interview is worth checking out over at Wallpaper. The Apple Pencil can be ordered from the online Apple Store for $99, but shipping dates range into late December. Apple retail stores have begun receiving larger Apple Pencil shipments as of today, so customers hoping for an Apple Pencil may want to seek one out in a store. According to all reviews, Pencil won't roll, despite being round. Comment Fail. Didn't Apple at one point say touchscreen navigation on Surface like tablets is unergonomic and people should not be reaching up from the keyboard to touch the screen to navigate? So what makes touchscreen navigation on the iPad Pro ergonomic when it has a keyboard docked like shown above? iPad Pro users don't need a stylus. Am I the only one who reads Ive's quotes in his accent??!?? It's like a song you can't get out of your head. The Pencil will not replace the hundred dollar bill in my wallet either. Apple's Pencil and Notability have finally allowed me to get rid of pads of paper to take notes on at meetings and during calls - they're a fantastic combination. Palm/wrist rejection is outstanding, latency very low, and can even import PDF files of forms to complete if handwritten completion of forms is necessary. At an interview or meeting, I've found that clients really don't want to watch you looking at a screen and typing, but taking handwritten notes on an iPad Pro is another matter. Except that it is weighted so it won't roll like that. There is a guy at work who has a Surface Pro 3 and the stylus works perfectly with that UI since it's as accurate as a mouse. He's getting around Windows so fast and fluidly, it just makes sense having a tablet UI for a finger and then a traditional Desktop for the Stylus. I just think it's such a big mistake to not do a Windows style two UI thing where you can switch. They've really made it work well with Windows 10 and I just think Apple will be left behind, I don't think a lot of people want to give up their x86 OS for IOS... for them they'll move away from the Macbooks and go to Windows as that hardware becomes more attractive with things like the Surface Pro and the Book. Things like Universal apps also make the ARM style tablet UI more attractive for developers to bring their content to it. I don't see who the iPad Pro is for, it's not a pro device and it's too expensive for mass consumers.